The African Wild Dog (also known as African Painted Dog) is similar in size to a domestic Alsation dog (German shepherd). It has large, rounded ears, long legs and a bushy, white tipped tail. The whole body is randomly colored with a mixture of black, white, brown and yellow blotches, which is why the African wild dog is sometimes called the African Painted Dog. The color pattern is unique to each individual, with no two dogs having the same markings. 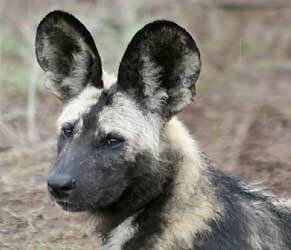 The wild dog's muzzle is black, with a black line of fur running from the muzzle to a point midway between the ears. Behavior: Wild dogs are active during the day because they rely mainly on sight to hunt. They also take advantage of bright moonlight for hunting, and tend to rest in shady areas during the hottest time of the day. Wild dogs are higly social animals, living in very close-knit packs comprising from two to 50 dogs. Wild dogs do not have territories but instead have enormous home ranges, covering hundreds of square km, over which they roam and hunt prey. See also Wild Dog Society. They are highly specialised hunters, able to run at speeds up to 65 kph and maintain a pace of 56 kph (35 mph) for several kilometers. Reproduction: Wild dog pups are born during the dry, winter months (March to July) when the grass is short and the hunting conditions are at their best. Between two to 10 pups are born after a gestation period of 69 to 73 days. Pups are born in abandoned burrows of other animals and stay near their den for the first three months of their lives. Hunting and Diet: Wild dogs are strictly carnivorous and are specialised hunters of medium sized antelope such as impala and wildebeest, but also catch animals as small as rabbits. The wild dog only kills for its immediate needs. The pack moves slowly towards the prey. A long chase then takes place, sometimes up to several kilometers. The prey either starts to get weary, or weakens after shock or loss of blood and then is overpowered by the pack. Dogs take bites out of the animal while it is still on the move but the victim's death is usually quick. See also Wild Dogs - Efficient Hunters that Kill to Eat. The wild dog is a very vocal species with a wide range of different calls. When the animal is excited, it gives a high pitched giggly twitter. Its long range call is a "hoo hoo" sound which carries for two to three kms. Wild dogs also whine, growl and bark threateningly, and their alarm call is a gruff bark. The African wild dog is also known as the African Hunting Dog, Cape Hunting Dog, and Painted Dog. 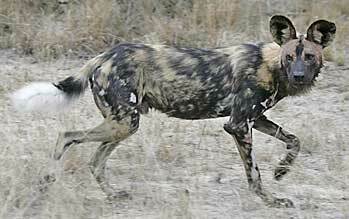 The wild dog is classified as Endangered (EN) on the IUCN Red List. For additional information about the African wild dog, see our gallery of Wild Dog Pictures.